Diyas and candles are lit in every household. 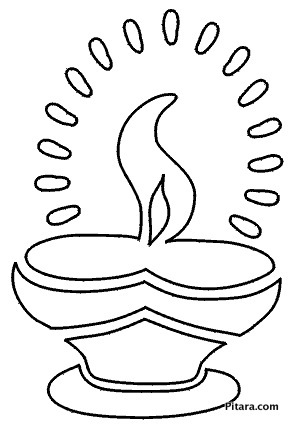 In fact, the name Diwali comes from a Sanskrit word ‘Dipavali’, which means ‘row of lamps’. Wherever you go, you will see houses, shops and public places decorated with earthen lamps, or diyas. Lighting diyas is a way of paying obeisance to god for providing wealth, knowledge and health. Legends say that the brightly lit lamps help Goddess Lakshmi find her way into people’s home. In this article you may enjoy the collection of many coloring pages on the very famous festival Diwali. 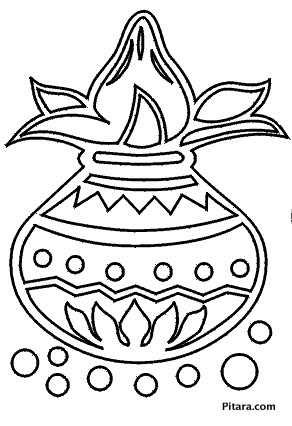 Most sorts are of original Diwali-themed colouring pages, including the famous festival Diwali Celebrations, children watching fireworks, Bhaiya-Dooj colouring pages, colouring pages illustrating the story of Rama and Sita and many more…….Diwali Colouring Pages may be print them out and give them to your child to color, sure they will like them and teach your kid something about the famous festival of Diwali. Diwali is a very beautiful festival and every child will enjoy setting down coloring the Diwali Colouring Pages very well. This Diwali coloring page features two excited children bursting crackers. Even the simplest rituals of Diwali is rather significant, including the bursting of firecrackers. The illumination of skies with firecrackers is an expression of obeisance to the heaven for the attainment of knowledge, peace, wealth and prosperity. The sounds of the firecrackers indicate the joy of the people living on earth. The sounds also make the gods aware of their plentiful state. How beautiful does this little house look decorated with diyas? On the eve of Diwali, people decorate their houses and premises with electric bulbs, diyas and candles to make the surroundings bright and colors. 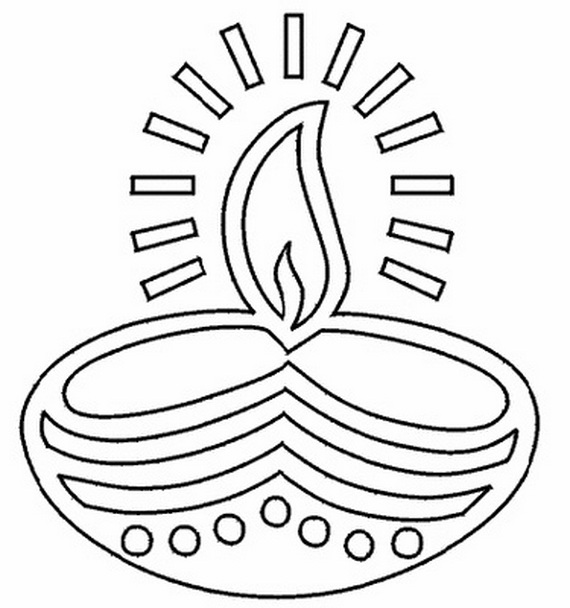 Diyas or earthen lamps are arranged in rows on threshold and windowsills. Light is a symbol of positive energy and hope. By spreading light to every nook and corner of the house, we try to destroy the reign of darkness. The light from the lamps also empowers us to commit to good deeds, making us closer to the divinity. 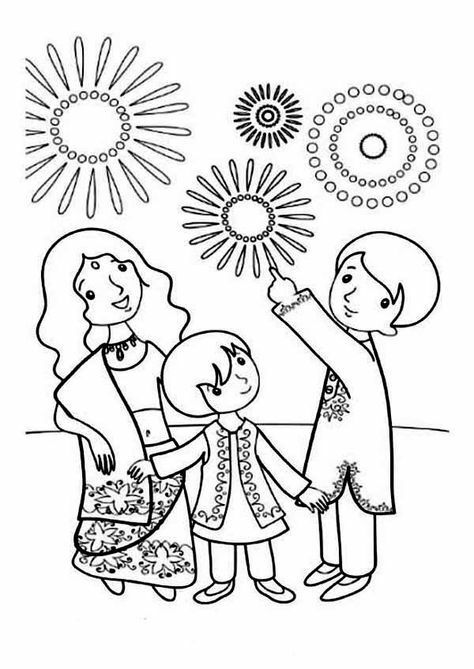 Here’s an adorable Diwali coloring page showing a brother and sister celebrating bhaiya dhooj. Diwali, along with joy and happiness, also brings with it the chance to revive the relationships. The fifth day of Diwali also called Bhaiya Dooj, honors the bonds between brothers and sisters. This day is entirely dedicated to brothers and sisters. Sisters apply tilak or teeka on their brother’s forehead and perform the Aarti. Some even cook special delicacies for them. The brothers, in return, give their sisters gift. The festival also marks the end of Diwali. Here’s another beautiful Diwali coloring sheet. Diwali is the perfect occasion to revive social ties. The festival encourages people to interact and socialize with each other and end the animosity. On the ceremonious occasion of Diwali, people pay visits to their friends, relatives, neighbors and business associates. They even exchange sweets and gifts with each other. Younger ones express respect to the elders and the latter showers blessings upon them. A friendly and pleasant atmosphere pervades all around the house. Diwali, fondly dubbed as the Festival of Lights, is the grandest and brightest festivals of India. Celebrated with utmost gaiety and fervor, Diwali signifies the ultimate triumph of good over evil. The festival marks the return of Lord Rama to Ayodhya. Diwali is illuminates the country with its brilliance and fills its people with joy. Here is our collection of ten printable Diwali coloring pages for your kid. Diwali commemorates the return of Lord Rama and Goddess Sita to the kingdom of Ajodhya after an exile of 14 years. It is a 5-day long festival. The first day is Dhan Teras; the second day is Naraka Chaturdasi and the third day is the actual Diwali. On the fourth day, we perform the Goverdhan Pooja and the fifth day is Bhaiya Dooj, the first day of Hindu New Year. Some people also believe that Diwali is the celebration of the marriage of Lord Vishnu and Lakshmi. In Bengal, the festival celebrates Kali, the goddess of strength. Wish a very Happy Diwali to your near and dear ones with this beautiful coloring page featuring Goddess Lakshmi. Have your kid color the diagram, either online or with his crayon set. Then make him write the greetings in glitter pen or felt pen. Here is a lovely Diwali coloring sheets that shows a happy family performing Lakshmi Puja. Lakshmi Puja is performed in the Diwali evening to bring prosperity and happiness to the family. Goddess Lakshmi is the symbol of the prosperity of wealth in Hinduism. She is also the consort of Lord Vishnu. The Pooja begins by lightning a diya or lamp. In some places, Lord Ganesh is also worshiped along with Goddess Lakshmi. It’s believed that worshipping the two of them together will bring wisdom and wealth together. This delightful Diwali coloring pictures shows a woman making an intricate Rangoli design on her house entrance. And look how happy those children look lighting firecrackers. Making beautiful Rangoli on Diwali is one of the long-standing traditions. The main purpose of making a Rangoli at the entrance is to welcome Goddess Lakshmi. 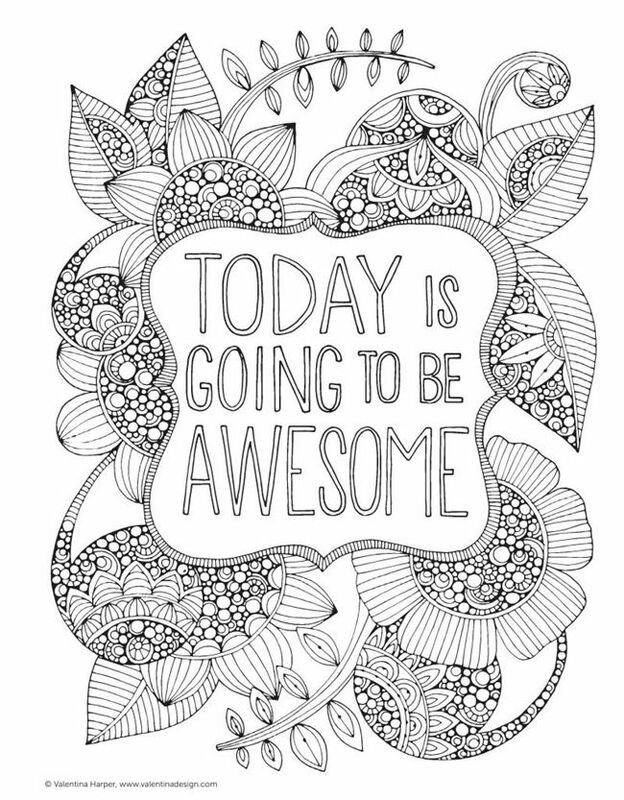 An evening backdrop will go best with this coloring page. Is your little one looking forward to Diwali? Are you looking for some ways to get her to understand more about why we celebrate it? If you nodded along, then out Diwali-themed coloring pages are here to help. 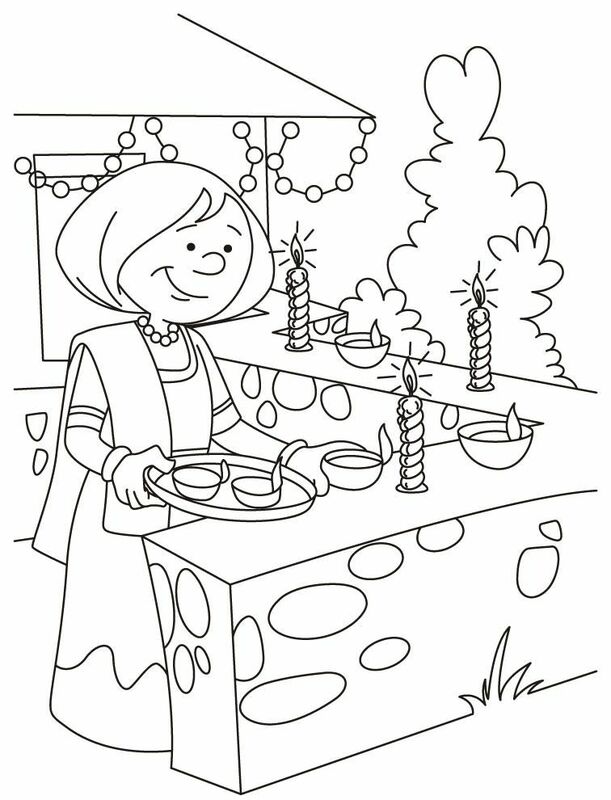 Teach your kids about the traditions and moral values of this festival through some of our Diwali coloring pages. This cute coloring page shows children arriving at their neighbor’s house with sweets. A vast assortment of sweets is made for Diwali. The sweets are shared not just with the family members, but also friends, neighbors, and relatives. It’s more of a custom now. You must also encourage your kid to read the sentences written on this coloring page. As she reads the small sentences on the coloring image, she can compose a short paragraph on the situation. What sweet does your child relish the most on Diwali? Our Diwali printable coloring pages will take you down to the memory lane when you would burst crackers with your neighbors and friends. Share a few fables and mythologies with your kid as he colors the page. You can share some of your Diwali memories with us too. How is your kid planning to celebrate Diwali? Share a few of her plans with us by commenting below.